4:1-3 – The opening address by Nebuchadnezzar. This chapter opens with a personal address to all peoples everywhere and announces the power and majesty of the God of Israel as the Most High God. The confession that he makes here is no small confession coming from a man who ruled the known world and had all things at his personal disposal. This is an announcement that is written after what follows, but also precedes it. Nebuchadnezzar speaks in the first person until verse 19, where the account shifts to Daniel’s interpretation of the dream and to the state of insanity. Then the account returns to the first person once Nebuchadnezzar’s sanity is restored again in verses 34 and following. 4:4-8 – Another dream and another call for interpretation. Nebuchadnezzar opens by describing himself as “contented” (Aram. šělěh “at ease/rest”) and “prosperous” (Aram. ra‘ănān “flourishing/luxuriant”; a term used in Biblical Hebrew to refer to trees which prepares us for the dream that follows; cf. Ps.92:15). In the very place where he felt most secure suddenly he was gripped by fear. His dream, now troubling him as he was awake, needed interpretation, but as before none but Daniel could give the interpretation. This despite the fact that here he actually shares the dream with those who should have been able to interpret it for him and this dream was certainly not difficult to understand the figures, so it appears that somehow the others were kept from the interpretation. The Babylonian name of Daniel is given (Belteshazzar) because that is the name he was best known by among the Babylonians, but still Nebuchadnezzar recognized that it was not per se “his god” that had anything to do with helping Daniel, but “the spirit of the holy gods” that was “in him.” The reference to the spirit by Nebuchadnezzar is a confession “of a real presence of God that contrasts with the spurious presence that the statue of chap. 3 claimed to bring” (Goldingay 87). The spirit of the “gods” (Aram. ‘ĕlāhîn) that Nebuchadnezzar refers to could still be taken in a singular sense (much as the name of the one true God is) even though grammatically it is plural (interestingly Theodotion has the singular theou), however it seems more likely that it is still a plural for Nebuchadnezzar given his use of the plural adjective for “holy” (Aram. qādîšîn) that is included with the noun. 4:9-18 – The Dream of the Tree. Nebuchadnezzar recognized that Belteshazzar had what the others of his kingdom did not and could interpret mysteries beyond understanding. The dream was as follows: he saw a great tree (cf. Ps.92; Eze.17; 19:10-14; 28; 31) that stood in the middle of the earth and reached to the heavens themselves. This tree provided was magnificent and provided shelter and food for all of the creatures. However, suddenly, in the dream a “messenger, a holy one coming down out of heaven” (this refers in Nebuchadnezzar’s own language to what we might call an “angel” which is a transliteration of the LXX here, whereas Theodotion has “watcher” following the Aramaic ‘îr which literally means “one who is awake”—see Miller 133—and thus they are just like their Lord—see Ps.121:4; also Karl Barth—Church Dogmatics III.3 pp.460-463—proposes that the true ministry of angels is to be witnesses to God’s word and work, and to the God who alone is Lord of all). The command is given to chop the tree down and strip it of everything, but to leave the stump. Actually, the stump was to be “bound with iron and bronze.” Are we to understand this in a positive or a negative way? This is actually a word of ultimate hope to Nebuchadnezzar since he is the tree. The bands on the stump refer to God’s allowing Nebuchadnezzar to “retain control of his kingdom” and let him know that God will eventually restore it to him “after he comes back to his senses” (Walvoord 106). In a time when any sign of weakness could mean a sudden overthrow and assassination, this was no time for insanity. It would actually require divine intervention for Nebuchadnezzar to be spared and restored. Suddenly the image shifts from a bound stump to one who will be forced to live as the animals though he had at one time provided for all of the animals. The time frame of “seven times” was set for the duration of this insanity, but does this refer to years or seasons? Miller (134-5) and Walvoord (103) think it likely it refers to years because of its relation to Dan.7:12, 25 and also the LXX translation as “years,” however Goldingay (81) and Baldwin (125) understand it to simply refer to “seasons” following the Theodotion translation and the more vague use of the same term outside of this chapter in Dan. 2:8, 9, 21; 3:5, 15. While the sense of “times” may be debated, perhaps also the sense of “seven” should be understood to refer to the fullness of the time for him. Perhaps this is too vague, but it also lends itself to understanding that God’s timing is always right on time. John Goldingay notes that the first reason we are given for the felling of the tree is not pride, but simply to “show that God rules” (93). It is only noted as secondarily a matter of humility. The interpretation would seem to be apparent, but for whatever reason the interpretation was not forthcoming from all those in the kingdom who should have interpreted and so Belteshazzar was called upon for the interpretation. 2:7). Note the parallels and contrast between the tree that is Nebuchadnezzar and the description Jesus gave of the Kingdom of God in Mark 4:30-32. Daniel emphatically tells the king that the “Most High” had issued a “decree” against him that he would live like a wild animal for “seven times” until he acknowledged “Heaven rules” (this is the only place in the OT where “heaven” stands for the name of God, but this became more common by the inter-testamental period and was particularly used by Matthew in his many—31 verses to be precise—references to the “kingdom of heaven” where the other Gospel accounts have a preference for “kingdom of God”) The acknowledgment that “Heaven rules” was an acknowledgment that the Most High was sovereign over everything and everyone. Nebuchadnezzar was informed that there was mercy in this for him. The Most High would preserve him until he acknowledges this, but he did not have to necessarily even face this suffering (though that would be left to the mercy of God). He could have followed the advice of Daniel and renounced his sins by doing right and also caring for the oppressed. “Nebuchadnezzar might not have been treating others cruelly but he probably did what many people do today, practiced an indulgent lifestyle and simply ignored the misfortunes of others” (Miller 139; cf. Isa.1:17). 4:28-33 – The fulfillment of the dream. Approximately one year after the dream and interpretation everything happens just as it had been predicted. It began with Nebuchadnezzar walking on the roof of one of his palaces (there were several in Babylon) and glorying in the majesty of “the great Babylon” (cf. Rev.14:8; 18:2) that he believed himself to have built by his own doing. Babylon was, of course, one of the most magnificent cities of the ancient world. Walls forty feet high wide enough for chariots to ride upon with gates that were renowned for their magnificence. He also built the hanging gardens for his wife that the Greeks labeled one of the Seven Wonders of the World. Perhaps it was even there that looked out upon that vast city and was in awe of the dozens of temples and the numerous palaces and mighty walls. A truly awe-inspiring spectacle, but just as the words were “still on his lips” suddenly “a voice came from heaven” with the decree that had been given in the dream. God not only was capable of giving all of Babylon to Nebuchadnezzar but of taking it from him, making him insane and keeping him from death in that state of insanity for seven times until he should be humbled and restored. “Perhaps one should say that the true insanity belongs to the Nebuchadnezzar who had earlier been talking as if he were the eternal king and God did not exist. His outward madness is the external expression of a delusion he has already been the tragic victim of” (Goldingay 96). The illness of Nebuchadnezzar finds allusion in the 2nd century BC Abydenus (Eusebius Praeparatio Evangelico 9.41.1) and the 3rd century BC Babylonian priest Berosus (Josephus Against Apion 1.20). Interestingly the LXX has added that his madness happened in his eighteenth year which would be the very year he destroyed Jerusalem (586BC), but the Theodotion Greek does not include this time note and neither does the Aramaic and it seems very unlikely (the LXX having a text that is ¼ longer in chapter four than the Aramaic; despite the fact that the LXX does not have 4:6-10a solving the dilemma of Daniel’s absence that the Theodotion did not have an issue with including). Stephen Miller proposes that it likely happened no later than 571BC which seems probable (128). According to Jewish legend, his son Amūl-Marduk ruled in his stead until his sanity was restored (Baldwin 128). Is it possible that Daniel may have actually cared for Nebuchadnezzar in this state? Somehow he was cared for and kept from the public so that he eventually could be restored. That alone speaks of God’s grace and mercy. 4:34-37 – The insanity ends and sanity begins. Nebuchadnezzar again writes whereas in his previous state he could not and it had to be told in the third person. Now he tells us that he looked to heaven and he was restored. What praise belongs to God who restores us when our profession can be as little as a crazed man who lifts his eyes finally to acknowledge the God who is sovereign over all? Nebuchadnezzar makes a profession of faith in God as sovereign over all, but how much a saving faith is perhaps beyond what we should conjecture. What does Nebuchadnezzar’s profession of faith teach us? Why did God choose to restore Nebuchadnezzar who had been given a chance earlier to do what was right and didn’t? Can we profess trust in a God that we know little about and it be sufficient? What can we learn about the kingdoms and authorities of this world through this account? John Goldingay comments that though Nebuchadnezzar’s dream of the tree between heaven and earth that was glorified and then shamed ends, there would “eventually be a very different tree, one which more effectively links earth and heaven and displays itself—or rather displays the one it bears—before earth and heaven; a tree which, moreover, also has to become a tree of shame—but not for its own shortcomings—before it can be a tree of glory. That tree will offer life, security, and provision in fuller senses—though the fuller sense must not exclude the physical senses which are this vision’s concern, and which are God’s own concern” (91-2). 47:1-6 – A trickle from the temple becomes a great river. The location that Ezekiel is shown may indicate where the “sea” was once kept in Solomon’s temple, but there is no mention of such a thing in this temple (1 Kings 7:23-26). While the directional descriptions are difficult it seems that the trickle flowed through the temple and out the eastern gate that was closed (Ezekiel even uses a Hebrew term that sounds like gurgling from a jug for it coming out the gate). Again, the man has his measuring rods and begins taking notes. At 1000 cubits (1500ft.) it was ankle deep, at 3000ft. it was knee-deep, 4500ft. it was waist-deep and at 6000ft from the temple it was already so deep that Ezekiel was forced to swim…and all of this without tributaries and from a trickle! 47:7-12 – The river from the temple brings miraculous life wherever it flows (cf. Gen.2:10-14; Ps.36:8-9; 46:4; Joel 3:17-18; Zech.14:5-11; John 7:38; Rev.22:1-2). “The scene calls for a miraculous act, the converse of that experienced by the Israelites at the Red Sea. Instead of creating a dry path through the sea, this holy stream produces a water course through the desert” (Block NICOT II:694). On the banks are many trees whose leaves will not whither providing “healing” and whose seasons have become months because of the life they receive from the river (cf. Ps.1:1-3; Rev.22:2). The river will flow to the Arabah (or the Jordan valley) and into the Salt Sea (the aptly named “Dead” Sea because it sits at 1400 feet below sea level and cannot sustain life) where it will not only turn its waters to fresh water (cf. Exo.15:25; 2 Kings 2:19-22), but will cause its waters to have more life than even the Mediterranean (the Great) Sea. In fact the whole (“from En Gedi to En Eglaim” refers to the western and eastern shores respectively) of the Sea will be changed to give life, with the exception that the low areas will still produce salt. Why should they be left? “It is necessary that salt should be available as an element of covenant consummation” (Duguid NIVAC 533). It will also serve as a blessing to those who fish and those who harvest. 47:13-23 – The boundaries of the land of Israel (cf. Num.34:1-15; Josh.15-21). Why does Joseph get two portions? Because there must still be twelve (this was also the counting of the tribes) and Levi receives his portion as a priestly portion and because Jacob blessed Ephraim and Manasseh as his own (Gen.48:8-20). Of particular significance are four things: first that they receive their portions as “inheritance” in the form of gift from a sovereign and not by right, and second that they “are to divide it equally among them”. This is significant, because this had never been done before. There was a greater equilibrium to be accomplished in Israel by this act. As part of this they each had a portion that ran from the Mediterranean inland and was exactly the same distance north-to-south. Third, all twelve of the tribes were to be reunited into one land again which had not been possible for several hundred years. Fourth, their boundaries were to exceed anything in their previous history. It is also notable that Ezekiel mentions the “aliens” (Heb. gēr) as being permitted to receive an inheritance if they settle and have children (cf. Lev.19:33-34; or the “foreigner” in Isa.56:3-8). In other words, this was not only a promised blessing for ethnic Israel, but for all who would identify themselves with the covenant community. 48:1-29 – The tribal, princely, sacred and city allotments. The tribes are largely rearranged from their earlier portions and there is no longer any mention of the territories possessed in the Trans-Jordan. Dan Block notes that in the allotment Bilhah and Ziphah’s sons are furthest out with Benjamin and Judah on both sides of the sacred precinct (cf. Josh.18:28; 1 Sam.9; 2 Sam.5:5-6)—though Judah is on the north and Benjamin the south—and Rachel and Leah’s sons are closest with Ephraim and Manasseh by each other (NICOT II:723-724; for the matronage see Gen.35:22-26). In the midst of verses 1-8 and 22-29 describing the tribal allotments is the focus of the chapter—the special allotment that is for the prince, the city and the sacred precincts. We have previously discussed this area in chapter 45 (for more detail see the notes there). Some of the new things emphasized here pertain to the workers that would be necessary for maintaining the city and the supply of food for all of the tribes as they take their turns in coming to the temple and the city. 48:30-35 – The exits of the city. There are twelve gates to this city which is considerably more than any normal city not to mention that it would be exceptional that any city should be square to begin with which has sacred connotations. The city is approximately one mile by one mile (contrast this to the New Jerusalem that is described as a cube-like structure approximately 1400 miles by 1400 miles by 1400 miles! Rev.21:16). Interestingly, Levi has a gate and so Joseph has a gate (which would be for both Ephraim and Manasseh). 45:1-6 – The sacred district. The full sacred area would cover an area seven miles wide and seven miles long. One section stretching seven miles long and three miles wide would be for the priests and would be for the “Most Holy Place”. Another section stretching seven miles long and three miles wide would be for the Levites who serve on behalf of the people of Israel in the temple. They would no longer have towns scattered among the tribes (as in Josh. 21), but would live with all of the rest of Israel focused upon the center: the temple as the presence of the LORD in the midst of His people. The “city” would take up a section about one mile wide and seven miles long for the whole of Israel. 45:7-12 – The prince(s) of Israel. No longer would the princes be allowed to abuse Israel as had occurred throughout Israel’s history, but would receive a portion of the land surrounding the sides of the sacred districts. What is the importance of fair measurements? (cf. Lev. 19:36; Deut. 25:13-16; Prov.11:1; Amos 8:5-6; Hos.12:7) One shekel would be approximately 4 oz. and therefore one minah about 24 oz. The ephah (for dry measurements) and bath (for liquid measurements) would be about 5.8 gallons and so the homer would be about 58 gallons total. 45:13-20 – Offerings for atonement. Why would the LORD be so specific about the offerings Israel was to offer? The offerings made of wheat and barley were nearly 2% of the total, the oil 1% and the sheep .5%. These sacrifices were specifically for atonement. What need would Israel have for atonement? Also, note that the prince plays a particular role in making provision for the sacrifices as well. There was to be an atonement made on the first day of the year and the seventh (were these to be repeated?) for atonement of the temple. Why would the temple need atonement? What sorts of sins were said to be covered by this sacrifice? 45:21-25 – The feasts. The requirements here are notably different than those found in the Torah concerning the Passover celebration (cf. Exo.12:1-28; Num.9:1-14; Deut.16:1-8). However, it is also notable that whereas there was never a repetition of the smearing of blood on the doorposts after the exodus from Egypt, yet in verses 19-20 the posts of the temple were to be smeared in sacrificial blood prior to the actual celebration of Passover that would begin a week later. The other feast day is unnamed but is said to occur at the time of the Feast of Tabernacles on the fifteenth day of the seventh month (cf. Deut. 16:13). 46:1-12 – The Sabbath and New Moon feasts. The eastern outer court gate was perpetually kept shut, but the inner courts eastern gate was opened every Sabbath and New Moon when the prince was to come and offer sacrifices and stand at the entrance of the gate giving worship to the LORD. The people were also to worship the LORD at that gate. The prince must come and go at the same gateway, but the people were to leave at the opposite (if they entered north they left south and vice-versa). What is the point of the control at the gates? The prince was to act as just another person and would not stay longer than the rest of the people though he was the only one permitted use of the eastern inner court gate which would be shut at evening after he had gone. There was a marked difference between what Ezekiel was instructed and what had happened throughout Israel’s history in regard to the ruler’s relations to the temple. 46:13-15 – The command to make daily offerings. Why might the language have shifted from the third person to the second person (“you”) for these few verses? Was Ezekiel expected to participate in this? Also, how does the nature of the sacrifices being a “lasting ordinance” relate to what is written in Hebrews 7:27; 9:25-10:18? 46:16-18 – The prince and his land. What is the importance of the inheritance being kept within the prince’s family and of the prince not being able to take any property from the rest of the house of Israel? (on acquisition of Israelite territories and inheritance issues see Deut.17:14-20; 2 Sam.9:7; 16:4; 24:24; 1 Kings 9:16; 16:24; 21:1-29) Many have often confused the notion of this “prince” with the Messiah, but Iain Duguid astutely notes, “It is the temple that points us to Jesus, not the prince” (NIVAC 524). 46:19-24 – The importance of the kitchens. Why should Ezekiel be shown the kitchens in the temple and why should these be mentioned for us? It is significant because temples of the ancient Near East were places for the gods to feast, but not for the general population, but in the temple of the LORD He prepares a table before His people and shares it with them (cf. Ps. 23:5; Matt. 43:6-12 – The temple torah is given. Ezekiel hears an undisclosed person’s voice that gives him the temple instructions (torah). Contrast the presence of the LORD in this temple to the one which Solomon built (1 Kings 8:48-49; Isa.66:1). It was always the LORD’s design to live with His people Israel. However, His continuing presence depends upon the holiness with which His people live. The LORD promises that Israel and her kings will no longer do what they had done before in defiling the temple and rejecting Him. In particular are the sins of the kings against the sanctity of the temple of the LORD when they set up idols for themselves (NIV’s “their high places” Heb. bāmôtām should likely read Heb. bemôtām “at their death”; see Duguid NIVAC 490fn5) and fornicated themselves. It is notable that the glory of the God of Israel no longer is enthroned upon the ark of the covenant, but upon Jerusalem itself and His temple (Jer.3:16-17; Block NICOT II:581). How might the plan of this temple cause Israel to feel shame for their sinfulness? It would appear that the whole of this temple area is designed for guarding the holiness of the LORD. The torah of Ezekiel and his function in the process of sanctifying the temple likens him to a second Moses (cf. Exo.29; Block NICOT II:606-7). 43:13-27 – The altars design and sanctifying. Why might the dimensions of the altar be of significance to Ezekiel’s audience? This altar area was approximately 1100 sq. ft. while the alter itself was nearly 600 sq. ft. and stood some 15 feet high. The trench on the outside of the altar could handle nearly 3800 gallons! (see Block NICOT II:601). This made it actually smaller than the one in Solomon’s temple (1 Kings 1:50-53; 2:28-29; 8 ½H x 17W x 17L) and much smaller than the one in Herod’s temple (Josephus JW 5.5.6§§222-226; 15H x 50W x 50L). The steps (against Mosaic instruction in Exo.20:26) to the altar notably face east when traditionally all of the altars had the officiating priest facing east. The altar still needed dedication through purifying (Heb. hattā’t traditionally read as “sin offering”; see Duguid NIVAC 491fn10) sacrifices and burnt offerings that were supposed to last the course of a week for atonement and then on the eighth day the priests would begin making regular offerings upon it. The animals were to be salted (cf. Lev.2:13; the “covenant of salt” in Num.18:19; 2 Chron.13:5; and see Mark 9:49-50) and their bodies disposed of outside the sanctity of the temple. How will the LORD treat this sanctifying work and what will be His response? 44:1-4 – The eastern gate was shut permanently once the glory of the LORD had entered through it. The prince (Heb. nāsî’) was the only one permitted into the gate to eat a fellowship offering before the LORD, but not through the gate. While this would offer some special blessing to the prince, he was still excluded (as the rest of Israel) from entering the temple itself and could not enter through the gate which the LORD had entered. Again, note Ezekiel’s response to seeing the glory of the LORD as the glory fills the temple. 44:5-9 – The entrances and exits of the temple. It was not only the priests and the kings of Israel that were responsible for the defiling of the temple, but the whole of the house of Israel. They were responsible for bringing foreigners into the temple (cf. 2 Kings 11:14-19) when the Levitical priests were supposed to have guarded the sanctity of it (Num.18:7, 21-23). It was not that foreigners weren’t allowed, it was that these foreigners were not a part of the covenant people of God and had not purified themselves. 44:10-14 – The restoration of the Levites. While the Levites had sinned they were promised to receive restoration as those responsible for the gates and certain of the sacrifices on behalf of the people of Israel. However, their idolatry was not without repercussions. They would not be given responsibility to actually approach the LORD, but instead would represent the people’s presence in the temple itself. 44:15-31 – The Zadokites priest’s blessings and responsibilities. It was not because the Zadokites were sinless, but they were more faithful than the Levites in general (cf. 1 Sam.3:11-14; 1 Kings 1:5-8; 2:26-27, 35). Therefore, they would be given the particular blessing and responsibility of serving directly before the LORD and making the necessary sacrifices. Their clothing was regulated in order to avoid both contaminating it with sweat (i.e. body fluids; see Deut.23:11-13) and to not “consecrate” the people when they leave the inner court before the LORD. On holiness as a dangerous contagion see Lev.10:1-3; Num.4:15; 1 Sam.6:19; 2 Sam.6:6-9. Their hair was never to be either unkempt or shaved off (cf. Lev.21:5, 10; 19:27), they were never to have alcohol when ministering (Lev.10:9), nor were they to marry any woman that might allow for the common Israelites to share in their inheritance. They were to teach the people, to serve as judges and to celebrate all that the LORD had commanded. They were to be kept from that which was dead (Lev.21:1-3) and to receive their inheritance in the LORD (Num.18:20) enjoying the sacrifices given by Israel (Exo.22:31; Lev.22:8; Num.15:20-21; 18:8-20). 40:1-4 – A new vision. The date given in verse one marks the twenty-fifth year of the exile of Jehoiachin and the fourteenth year since the destruction of the temple and Jerusalem (April 28, 573BC). The twenty-five year mark may be given in particular to suggest the turning point towards the fifty year Jubilee (Block NICOT II:512). The tenth day of the first month (likely Nissan for the religious calendar and not Tishri of the civil calendar) would be the commencement of the Passover festival (Exo.12:3) though Ezekiel curiously does not mention this. It has been proposed that Ezekiel may be giving a counter to the Babylonian New Year’s celebration (Akk. akītu) which was celebrated on the same day and wherein Marduk their chief deity was annually re-enthroned (see Block NICOT II:513). Where might “the very high mountain” be located and what does this mountain represent? (cf. Eze.17:22; 20:40; Isa. 2:2-3; Mic.4:1; Rev.21:10) What does Ezekiel see from the south side of the mountain? The man who appears to Ezekiel acts as a guide and will reveal to Ezekiel particular dimensions of the visionary temple in order for Ezekiel to share this with Israel. 40:5-27 – The outer gates and the outer court. What is the purpose of the wall surrounding the temple? The measurement tool of the visionary guide follows the royal cubit instead of the common cubit and measures approximately 1 and ¾ feet long and so his “rod” is approximately 3 ½ yards (or 10 ½ feet) long. This would make the wall about 10 feet thick and 10 feet tall (though almost no other height measurements are listed anywhere else). Why did Ezekiel approach from the east first? Note the many rooms for guards in the massive gate. Why would there need to be so many guards and security? Take note of the many measurements that are multiples of 25 throughout this visionary temple and the very simple carvings. Who accessed the “outer court”? Note the dimensions of the gates and the outer court. Also, the steps from to the gates are seven. 40:28-47 – The inner gates and the inner court. Note the dimensions and decorations of the inner court and the eight steps which led up into it. Each of the gates are identical (both outer with each other and the inner with each other respectively). The furniture of the inner court is specifically only for the various sacrifices – burnt (Heb. ‘ōlâh; cf. Lev.1:3), sin (Heb. hāttā’t; cf. Lev.4:2-3, 13) and guilt (Heb. ’āŝam; cf. Lev.5:6; 6:6; 7:1-2) – whether tables, hooks (? ), or utensils. The guards were apparently Zadokite Levites responsible for all of the temple precincts security and priestly ministry (Block NICOT II:537-9; cf. Num.18:1-7; 2 Sam.8:17; 2 Kings 11:4-7). Note the place of the altar in relation to the temple proper. 40:48-41:26 – The temple proper. The temple was again located higher (10 steps up) than the inner court (eight steps up) which had been higher than the outer court (seven steps up) – leading to a total of twenty-five steps. It is also set up higher so as to protect the holy from the profane and the profane from the holy. 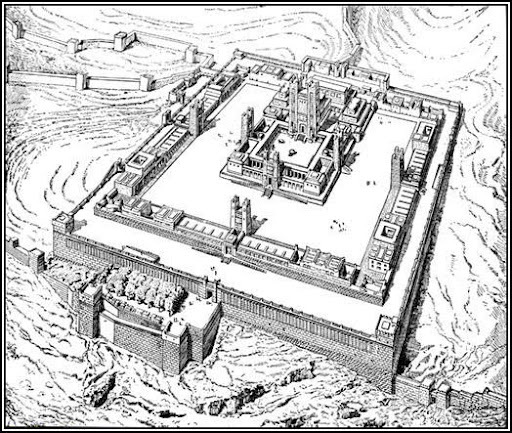 While Ezekiel is taken through much of the wider building(s), he is only informed about the dimensions of the “Most Holy Place” of the temple. The doors of each level also get progressively smaller and there are fewer and fewer that are permitted beyond each. The decorations of the temple itself are cherubim and palm trees, which is considerably less ornate than Solomon’s temple or even the tabernacle of Moses. The wooden table in the holy place just in front of the most holy place was likely for showbread (though there is not specific mention of its purpose here). 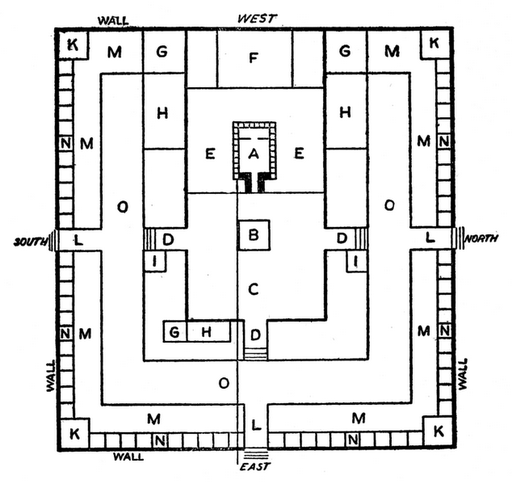 42:1-20 – Rooms for the priests of the temple. Rooms stacked three stories high were built along the north and south sides of the temple proper in order to provide sacred space for the priests to eat the special offerings and to change out of their priestly garments. Why should they change their clothes or eat in the sacred areas? What are the dimensions of the whole complex as shown to Ezekiel? er did fit the description of Ezekiel’s vision, nor does there appear to have been any attempt to even try. Why is this? What might this temple point to? Is this temple representative of something or will it (as according to typical Dispensational beliefs) be built in a millennial reign of Christ? If it would be built in such a time, why should there be continued sacrifices offered and what does this make of the once-for-all sacrifice of the Lord Jesus Christ? Perhaps the best way forward is not to view this temple as prescribed to be built at some future time, but simply as indicative of the utter holiness with which God dwells. Also, how might we understand this temple in light of Jesus claim of being the “temple” (John 2:19-21) and of Paul’s later comments regarding the individuals of the Church (1 Cor.3:16-17; 6:19) as well as the Church corporately being the “temple” (2 Cor.6:16)? 37:1-14 – The valley of dry bones. Once again the “hand of the LORD” was on Ezekiel (cf. 1:3; 3:14, 22; 8:1; 33:22; 40:1) and the Spirit (Heb. rûah) of the LORD set him right in the middle of a valley filled with dry bones (note the contrast between this valley of death and the mountains of fruitfulness in the previous chapter). The bones are strewn everywhere showing that there was no proper burial for those who died and they are described as “dry” because they were well beyond any type of resuscitation. Why did the LORD ask Ezekiel if these bones could live and what does Ezekiel’s reply signify? Can the LORD do this work, or better, will the LORD do this? It demonstrates Ezekiel’s dependence upon the LORD and recognition that everything depends upon His will and doing. Why should Ezekiel prophesy to the bones? “Yahweh’s goal in reviving these bones is not simply the biological-chemical reconstition of the body or even the restoration of physical life. He desires spiritual revival: a new recognition of and relationship with himself” (Block NICOT 376). What are the contents of his prophesying to the bones? Note the emphasis upon the breath (Heb. rûah) of life in order for the bones to live even after being attached with everything else anatomically necessary (cf. Gen.2:7). What is the point of the LORD’s giving life? Ezekiel seems surprised by the immediate reaction and sound of the bones being joined to each other and then the tendons, flesh and skin being added. Note the lack of life because there was no breath (Heb. rûah) in them. Why might the LORD require Ezekiel to prophesy again before they would be given life? What does it mean for Ezekiel to prophesy to “breath” (Heb. rûah) and call it from the “four winds” (Heb. rûahot cf. Deut. 28:25-26; Jer.34:17-20) before the “breath” (or “Spirit/spirit” again Heb. rûah) would come into them so that they might live? The Hebrew term rûah occurs ten times in the first fourteen verses of this chapter with the nuanced meanings as agency of conveyance (vs. 1), direction (vs. 9), and animation (vv. 5-6) (see Block NICOT II:373). The bones which were brought to life as people stand up on their feet much like Ezekiel at his commissioning (cf. Ezek.2:2; 3:24). What do the bones represent? (see vv. 11-14) Note that the metaphor is no longer of a valley of bones, but of the graves of the whole house of Israel (Judah and Israel) that will be opened (cf. Matt.27:52-53) and from which they will be raised to life by the infusion of the LORD’s Spirit (Heb. rûah) into them. Why does the LORD state that He will do this? There are many of the Church Fathers that understood this first section as referring to a general resurrection: Justin Martyr, Irenaeus, Tertullian, Cyprian, Cyril of Jerusalem, Epiphanius of Constantine, Ambrose, Severus and John of Damascus (Zimmerli Hermeneia II:264). 27:15-28 – One king over one nation of Israel. Ezekiel is told to take two “sticks” (Heb. ‘ēsîm which may also be translated as “writing tablets” which would possibly include the contents of the two part prophecy that makes up the remainder of the chapter – in favor of this interpretation see Block NICOT 398-406, 409) and write on each addressing the two previous nations: Judah and Israel (Ephraim who was the youngest son of Joseph – cf. Gen.48:8-20; 49:22-26; Deut.33:13-17). Why are the two sticks inscribed and what does holding them together signify? Notice in the explanation the LORD gives through Ezekiel that Judah takes the priority before “Ephraim” though they are joined together to form a unity in the LORD’s hand. This is not only a prophecy of unity, but of a return from exile for all of the tribes of Israel as the one people of God. What would be the obstacles to accomplishing this and where would the LORD return His people? There would no longer be any multiplicity of kings, but only one king chosen by the LORD to rule the one nation. Also, the one kingdom would be holy and no longer continue in sin and depravity, but would be cleansed and enter into the covenant they were always supposed to have with the LORD as their own God and they as His own people. What does it mean for “David” to be the one king and “shepherd” over the united kingdom of Israel? (cf. 2 Sam.7) Does election to be a part of the one people mean there is no requirement for how one lives? Note the repetitive use of “forever” and “one” in this extended passage (cf. Gen.28:13-15; 35:9-15). What is a “covenant of peace” (Heb. bĕrît ŝālôm cf. Eze.34:25-31) that is “an everlasting covenant” (Heb. bĕrît ‘ôlām cf. Isa.24:5; 55:3; 61:8; Jer.32:40; 50:5)? What does it mean for the LORD’s sanctuary and dwelling place to be among His newly constituted people? How does His presence make “holy”? Walther Zimmerli, Ezekiel (trans. R. E. Clements; 2 vols., Hermeneia; Philadelpia, PA: Fortress, 1979). It is a paradox that while we shutter to see the horrors of natural catastrophes, famine and disease, yet we hold in high reverence (as Khalil notes) those who destroyed whole peoples, slaughtering their women and children, depriving of brother and father, laying waste their fields and livelihoods. It is shocking how we could idolize such persons. I speak for myself when I say that my heart is stirred to repentance that I have held such men in high esteem…ignoring their ignominious deeds and monstrous acts. As I’ve taught through Ezekiel for our Wednesday Bible study group these last many months the horrors of destruction have driven me into a weekly sorrow. It was only those wicked ones about Israel that celebrated her destruction and exile…and the LORD promised those nations that their rejoicing would lead to their sorrow (see Eze.26-28). It is perhaps noticeable as well that whereas David did not wish to suffer at the hands of man, but if he must suffer judgment to suffer pestilence in the hands of the Merciful God (2 Sam.24:13-14). Should we not feel “fear and tremor” at the violence of men who did not fear God and instead were destroyers of those made in God’s image? Lord help us to not rejoice at the sorrow of others, but to give due honor to You as the Lord and Giver of Life. May we be found in your merciful hands and granted the mercy we show to others. 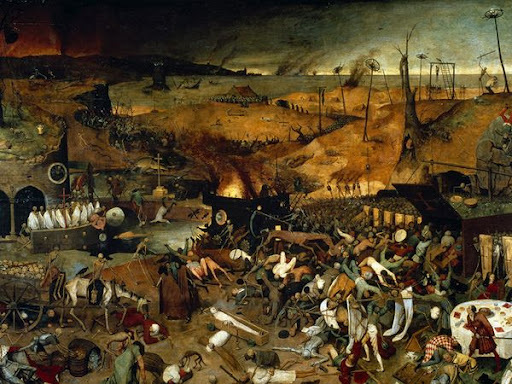 Author Rick WadholmPosted on August 17, 2010 Categories 2 Samuel, Ezekiel, Khalil GibranLeave a comment on Celebration of Destruction?